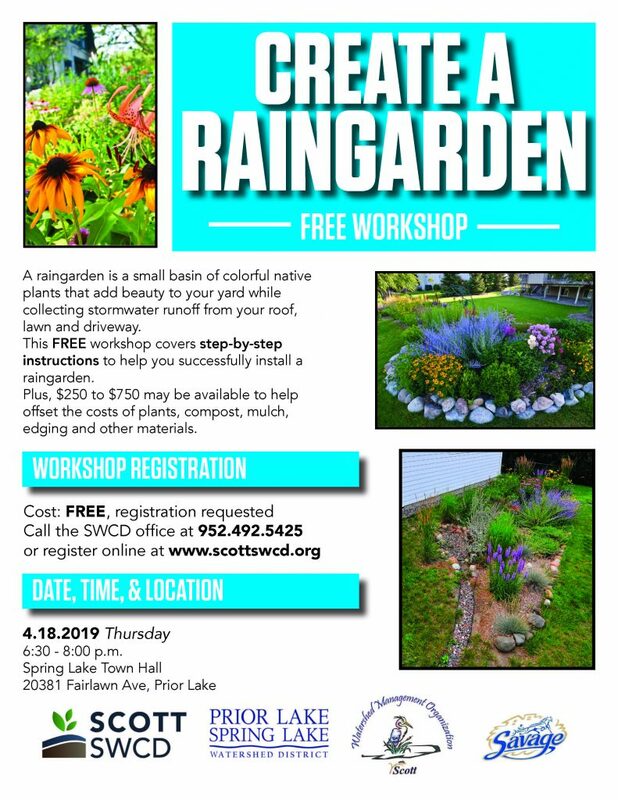 PLSLWD & the Scott Soil and Water Conservation District are hosting a free raingarden workshop on Thursday, April 18th from 6:30 to 8 pm at the Spring Lake Town Hall, 20381 Fairlawn Ave, Prior Lake. A raingarden is a small basin of colorful native plants that add beauty to your yard while collecting stormwater runoff from your roof, lawn and driveway. This workshop will give you step-by-step instructions to help you successfully plan and plant a raingarden. An incentive of $250 to $750 may be available to help offset the costs of plants, compost and labor when you install a raingarden. The workshop is open to all Scott County residents. To register, visit scottswcd.org or call the Scott SWCD office at 952-492-5425.